Center Membership offers reduced rates on swim lessons. Take advantage of our special monthly membership offer and start saving! Practice is everything! The more your child is in the pool, the more confidence they will have in performing their skills when in class. Research shows that children who learn water safety skills also reap benefits in overall cognitive, physical, and emotional development…and knowing how to swim may very well save your child’s life one day. Try playing these pool games with your child to help reinforce the skills they are learning in swim class! Practice talking to pretend fishies by getting your child to blow bubbles in the water. Then ask him to put his ear in the water to listen to the pretend response. Skill: Breath control is the first step in teaching your child to swim independently. Accidentally swallowing water can be a frightening setback, so make sure you encourage your child to submerge their face and blow bubbles to increase their comfort level in the water. Hold your child securely under their arms, facing you. Start walking backward through the water. As you pick up speed, the water will gently push them into a front float position. Spin slowly in a circle and chant, “Motorboat, motorboat, go so slow.” Pick up more speed and say, “Motorboat, motorboat, go so fast.” With the last line, “Motorboat, motorboat, step on the gas!” you can either blow bubbles or encourage your child to kick their feet. 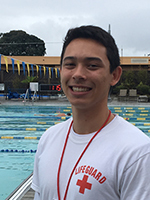 Austin is a committed lifeguard who makes sure our swimmers stay safe in the water. He plans to continue his dedication toward safety in yet another role when he becomes a fire fighter! He is currently enrolled in the Fire Technology program at the College of San Mateo. Austin loves all types of music, but his favorite is country. In his free time, he likes to go dirt bike riding and hopes to visit Costa Rica one day. 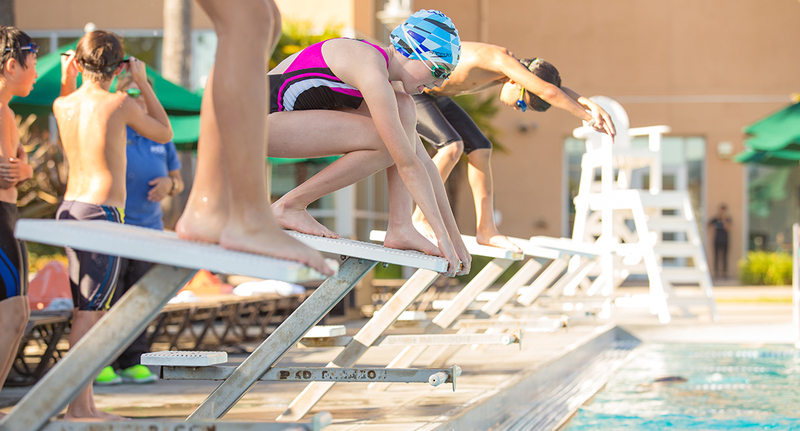 Whether your goals are open water training, competitive swimming, or you just want to hone your technical swimming skills, the PJCC’s Adult Swim Clinic offers workouts for both advanced and beginning swimmers. Low student-to-teacher ratios also allow you to address personal objectives and set goals. If you haven’t yet registered for an April session, limited space remains, so don’t delay. And don’t forget to save your spot for new sessions beginning Tuesday, May 1. All sessions are now open for registration. We do not offer make up classes for missed classes. In some cases, we will honor a doctor’s note if the child was seen by a physician, and will make arrangements for a swim lesson credit. Children must be accompanied to their lesson. Dropping a child off in front is not an option. Parents/caretakers of children ages 7–12 years MUST remain in the facility. Parents/caretakers of children under 7 must stay on the pool deck during the lesson. Arrive 5–10 minutes early so that you can check in with our deck supervisor at the beginning of each class. Children who are going to spend a prolonged period of time in the water should wear water shoes to protect their tender soles. Children under the age of seven must be accompanied by an adult at all times, and this includes before and after each class. This means we need you in the water with them! Interested in becoming a lifeguard? PJCC is holding lifeguard certification classes beginning April for participants 15 years of age or older. To register or learn more, call the Aquatics office at 650.378.2782. In addition to lifeguards, we’re also looking for dedicated staff to teach swim lessons and coach our awesome youth swim team, The Barracudas. Please contact Aquatics Manager Courtney Smith.